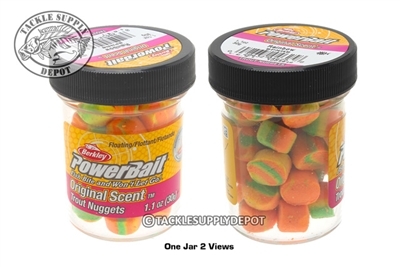 Berkley PowerBait Power Nuggets take away the mess of fishing with trout bait while increasing your chances of a solid hookset. Designed to resemble the same hatchery food that many trout are reared on these trout nuggets feature the legendary PowerBait formula which releases a burst of scent and flavor. This in turn causes trout to hold longer on your line so you have more time to score a hookset. Berkley PowerBait Trout Nuggets are also pre-formed, so there's no fussing with messy bait when you're rigging your hook.